An international team including scientists from Princeton University has detected subatomic particles deep within the Earth's interior. The discovery could help geologists understand how reactions taking place in the planet's interior affect events on the surface such as earthquakes and volcanoes. Someday, scientists may know enough about the sources and flow of heat in the Earth to predict events like the recent volcanic eruption in Iceland. The finding, made by the Borexino Collaboration at the Gran Sasso National Laboratory of the Italian Institute of Nuclear Physics, was reported in a paper published in the April issue of Physics Letters B. The work builds on earlier evidence of so-called "geoneutrinos" obtained during a Japanese experiment in 2005. "This is an important result," said Frank Calaprice, a professor of physics at Princeton and one of the study's authors. "It shows that geoneutrinos have been detected and firmly establishes a new tool to study the interior of the Earth." Neutrinos, which are chargeless, inert, fundamental particles, are emitted by the sun and cosmic rays entering the Earth's atmosphere. Geoneutrinos are antineutrinos -- neutrinos' antimatter counterparts. Geoneutrinos originate from the radioactive decay of uranium, thorium and potassium in the Earth's crust and mantle -- the thick layer extending to 1,800 miles below the surface. At laboratories like Gran Sasso, researchers are using instruments that act as geoneutrino "telescopes," looking into the Earth's interior by detecting these curious particles. 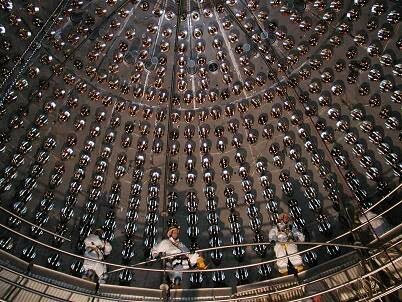 Scientists expect that geoneutrinos will aid them in better identifying what constitutes matter deep within the Earth. "It's a very significant discovery and holds much promise for better understanding the composition of the Earth and how the Earth operates," said Thomas Duffy, a professor of geosciences at Princeton, who was not involved in the research. Earth scientists would like to know more about the crucial role that decaying elements such as uranium and thorium play in heating up the Earth and causing convection in its mantle -- the slow, steady flow of hot rock in the interior carrying heat from great depths to the Earth's surface. Convection, in turn, drives plate tectonics and all the accompanying dynamics of geology seen from the surface -- continents moving, seafloor spreading, volcanoes erupting and earthquakes occurring. No one knows whether radioactive decay dominates the heating action or is just a player among many factors. The origin of the power produced within the Earth is one of the fundamental questions of geology, according to Calaprice. The definite detection of geoneutrinos by the Borexino experiment confirms that radioactivity contributes a significant fraction -- possibly most -- of the power, he said. The Borexino experiment actually was designed to detect low-energy solar neutrinos, not geoneutrinos. "As we were building the experiment, we realized we had the capability of detecting particles that were coming at us from the radioactivity deep inside the Earth," said Cristiano Galbiati, an assistant professor of physics and another of the 13 Princeton collaborators among the 88 scientists involved in the research. 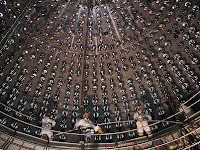 The Borexino project is located nearly a mile below the surface of the Gran Sasso mountain about 60 miles outside of Rome -- an ideal spot for studying neutrinos because the rock shields the detector from other types of radiation and particles that would overwhelm the sensing device. Much of the Borexino experiment is a process of eliminating the "noise" of background radiation. Neutrinos are notoriously difficult to detect because they usually pass straight through matter, rarely interacting with it. The detector is composed of a nylon sphere containing 1,000 tons of a hydrocarbon liquid. An array of ultrasensitive photodetectors is aimed at the sphere that is encased within a stainless steel sphere. All of this is surrounded by 2,400 tons of highly purified water held within another steel sphere measuring 59 feet. Solar neutrinos produce one type of signal when they come into contact with the detector, and geoneutrinos produce another type. Because there are a thousand times fewer geoneutrinos striking the detector, there are only a few events that occur per year. The paper describes two years of results, running up to December 2009. The experiment is continuing. The importance of geoneutrinos was pointed out by scientists in the 1960s, and a seminal study by Lawrence Krauss, Sheldon Glashow and David Schramm in 1994 laid the foundation for the field. In 2005, a Japan-U.S. collaboration called KamLAND operating an experiment at a mine in Japan reported an excess of low-energy "antineutrinos." Scientists can envision a day when a series of geoneutrino-detecting facilities, located at strategic spots around the globe, can sense particles to get a detailed understanding of the Earth's interior and the source of its internal heat. This data could provide enough information to predict the occurrence of events such as volcano eruptions and earthquakes.